Cycling a double acting cylinder is necessary in many applications, including: agitators, product life testing, reciprocating pumps and manufacturing processes. Clippard's VA-06 control module makes this easy. The VA-06 kit includes tubing and an acrylic manifold with the valves already mounted on it. Hook-up is easy—just connect supply pressure to the port labeled supply, and connect the cylinder extend and cylinder retract to the double acting cylinder. Turn the air on, flip the toggle, and make cylinder speed and delay adjustments as desired. The VA-06 control module is incredibly versatile due to the fact that it cannot only control the speed that the cylinder actuates, but can also control delays at the end of the stroke. A toggle valve is provided for the standard on/off function of the board, but it can easily be removed and a pneumatic circuit can be used to turn the circuit on and off, or an electronic valve can be used in conjunction with a PLC. The outputs may also be used to pilot larger pneumatic or hydraulic valves for more application possibilities. 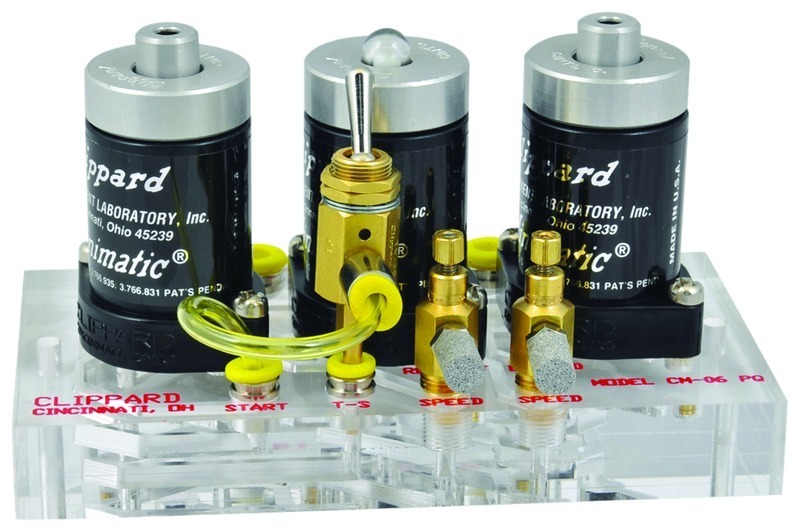 For cycling a single acting cylinder, see Clippard's VA-011 control module.